Let's look at other measures for describing distributions. 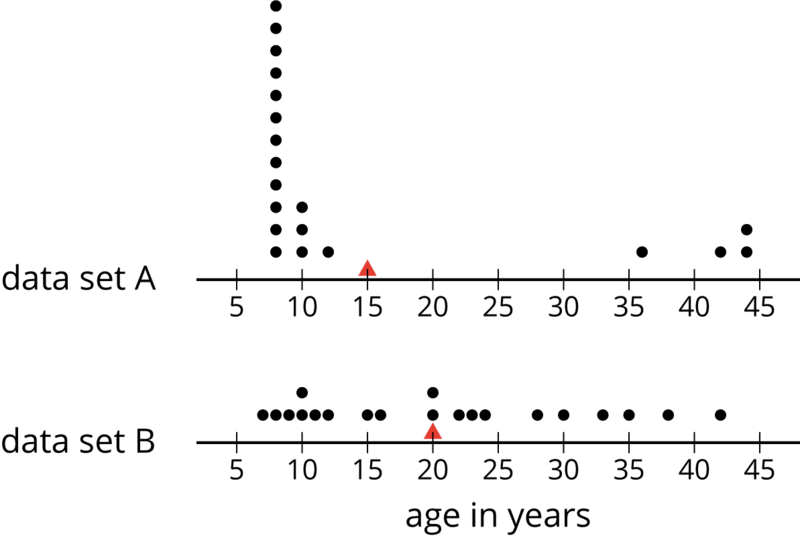 Here are two dot plots including the mean marked with a triangle. Each shows the ages of partygoers at a party. What do you notice and wonder about the distributions in the two dot plots? Here are the ages of a group of the 20 partygoers you saw earlier, shown in order from least to greatest. Find and mark the median on the table, and label it “50th percentile.” The data is now partitioned into an upper half and a lower half. You have now partitioned the data set into four pieces. Each of the three values that “cut” the data is called a quartile. The second quartile is the median. Write “Q2” next to that label. The third (or upper) quartile is the 75th percentile mark. Write “Q3” next to that label. Record the five values that you have just identified. They are the five-number summary of the data. The median (or Q2) value of this data set is 20. This tells us that half of the partygoers are 20 or younger, and that the other half are 20 or older. What does each of the following values tell us about the ages of the partygoers? Here is the five-number summary of the age distribution at another party of 21 people. Do you think this party has more or fewer children than the other one in this activity? Explain your reasoning. Are there more children or adults at this party? Explain your reasoning. Here is a dot plot you saw in an earlier task. It shows how long Elena’s bus rides to school took, in minutes, over 12 days. Write the five-number summary for this data set by finding the minimum, Q1, Q2, Q3, and the maximum. Show your reasoning. The range of a data set is one way to describe the spread of values in a data set. It is the difference between the greatest and least data values. What is the range of Elena’s data? Another number that is commonly used to describe the spread of values in a data set is the interquartile range (IQR), which is the difference between Q1, the lower quartile, and Q3, the upper quartile. What is the interquartile range (IQR) of Elena’s data? The interquartile range (IQR) is the length that contains the middle ______ of the values in a data set. Here are two dot plots that represent two data sets. a. Which data set has the smaller IQR? Explain your reasoning. b. Which data set has the smaller range? Explain your reasoning. Check your predictions by calculating the IQR and range for the data in each dot plot. Earlier we learned that the mean is a measure of the center of a distribution and the MAD is a measure of the variability (or spread) that goes with the mean. There is also a measure of spread that goes with the median called the interquartile range (IQR). Finding the IQR involves partitioning a data set into fourths. Each of the three values that cut the data into fourths is called a quartile. The median, which cuts the data into a lower half and an upper half, is the second quartile (Q2). The first quartile (Q1) is the middle value of the lower half of the data. The third quartile (Q3) is the middle value of the upper half of the data. Here is a set of data with 11 values. The median (Q2) is 33. The first quartile (Q1) is 20, the median of the numbers less than 33. The third quartile (Q3) is 40, the median of the numbers greater than 33. The difference between the minimum and maximum values of a data set is the range. The difference between Q1 and Q3 is the interquartile range (IQR). Because the distance between Q1 and Q3 includes the middle two-fourths of the distribution, the values between those two quartiles are sometimes called the middle half of the data. The bigger the IQR, the more spread out the middle half of the data are. The smaller the IQR, the closer the middle half of the data are. We consider the IQR a measure of spread for this reason. A five-number summary, which includes the minimum, Q1, Q2, Q3, and the maximum, can be used to summarize a distribution. The five numbers in this example are 12, 20, 33, 40, and 49. Their locations are marked with diamonds in the following dot plot. Different data sets could have the same five-number summary. For instance, the following data has the same maximum, minimum, and quartiles as the one above. The range of a data set is the difference between the maximum and the minimum. The interquartile range of a data set is a measure of spread of its distribution. It is the difference between the third quartile (Q3) and the first quartile (Q1). The quartiles for a data set are three numbers that divide the data set into fourths. The median divides the set into two halves, and the first quartile (Q1) is the median of the lower half. The second quartile (Q2) is the median itself, and the third quartile (Q3) is the median of the upper half.